The history of pasta making in Gregnano, Italy a small town just down the coast from Naples dates back to the late 6th century. Pasta is actually a relatively new term. To the Italians it is macaroni. Production of macaroni became really important as an industry in the mid 17th century and was referred as white gold. 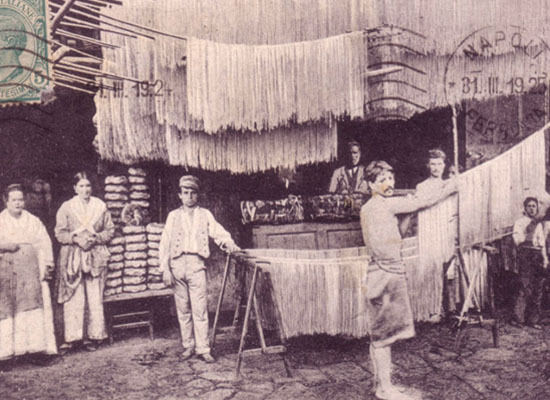 The climate was ideal for production and as you can see in the picture residents literally dried the pasta in the streets. 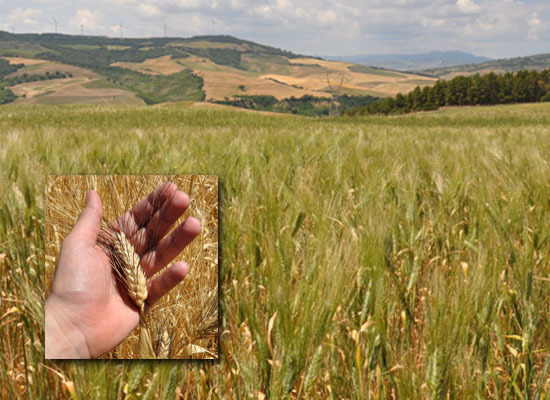 Gentile Pasta is made from a an heirloom variety of Durum Wheat known as Senatore Cappelli. This wheat gives Gentile pasta its aroma and flavor. It contains a high percentage of gluten (much different than the gluten found in GMO wheat) so it is rich in amino acids, vitamins and minerals. Prepared al dente it is very digestible. It is an ancient variety that has not undergone genetic manipulation. This wheat reaches heights of 6 ft which so dominate the land it suffocates weeds which makes it perfect for organic farming. An engineer named Cirillo realized impossibility of continuing to dry the pasta in the street and created a method that would simulate the natural drying method inside the pasta factory. He released the production from the variables of weather and reduced drying times from ten days when dried in the streets to three or four days in the factory. This is as opposed to the industrial producers which dry their pasta in 4 hours creating what artisan pasta makers refer to as burnt. San Nicola dei Miri by Gentile offers Organic San Marzano and Piennolo Tomatoes along with their tomato purré Passata di Pomodoro. These sweet mineral rich tomatoes and purré are the foundation for great red sauces.. Served this with grated Pecorino di Fossa a sheep’s milk cheese from Emilia Romagna. For those of you who are lactose intolerant look to better cheese mongers for sheep and goats milk cheeses. There are all sorts of cheeses you can grate instead of Parmesan. Do not hesitate to be spontaneous… I put every thing but the kitchen sink in this one. The other night I caramelized a medium size yellow onion In a skillet with a couple of table spoons of EVOO then added a couple of cloves of sliced garlic and turned down the heat. While the onions were doing their thing I had seeded the Peinnolo tomatoes (sometimes I do this step sometimes I don’t). Basically I squeeze the tomatoes till they burst into a strainer over a mixing bowl and put the seeded tomatoes in the bowl along with the water it was packed in. Then I will push the pulp and juice in the strainer into the bowl isolating the seeds (don’t waste any of the juice, pulp or water it all goes into the sauce). Then I added the tomatoes, juice, pulp, water and a tsp. of our Bomba Pepper Paste to the skillet and let it simmer turning it frequently with a wooden spoon. The tomatoes basically break up and melt into the sauce. I then added a quarter cup of Nero D’ Avola one of my favorite wines from Sicily which is completely optional. I started cooking the pasta when the sauce was almost done. At about 2/3 to 3/4 the recommended cooking time I pulled the linguine from the pot with tongs and added it directly to the sauce. I will turns it with tongs or tossing it with a wooden fork and spoon adding pasta water from the pot as necessary for the remainder of the cooking time. (We are live at 5000 ft. so cook times are longer so account for that if you live at altitude). Definitely taste test… bite through the pasta and when the white core is almost gone it’s Al Dente. Firm bite but tender. Theoretically when practicing this technique the pasta releases it’s starch into the sauce and acts as a natural thickener. Finished it with a drizzle of Alberto Romano Ortice Riserva EVOO which also happens to be from Campania. Turned out great served it with Dolce Italian sausage from Frody’s Salt and Smoke in Salt Lake City (Click Here To Visit). Frody is from Austria, uses only heritage pork and is one of the best butchers in the country. He grew up on a farm and has been doing this since he was old enough to to be trusted with a knife. He has a fantastic repertoire. If you are ever in SLC visit him better yet call him and ask him to ship you a case. Put them in the freezer and pull one out when ever you have a yen for sausage. It is simply the best! The flagship of Gentile’s production is it’s hand made Fusilli. The women who perform this skill are called “Fusillare” and roll up each noodle with a knitting needle below their forearms. This gives the pasta its helical shape which is then made even more appealing by the diversity of each individual fusillo. These segments of production done by hand are what distinguish the true artisan producers all aver Italy. Bomba is a hot cherry pepper paste from Magnifici del Mezzogiorno in beautiful Calabria which is essentially the toe of the boot in South Western Italy. We use it as a substitute for red pepper flakes. The flesh of the cherry pepper adds a richness to any dish or sauce that requires a little heat. I use it in my Rocky Mountain Poke recipe rather than Japanese Pepper Powder because I prefer to eat preservative free foods and it really livens up the Poke. They also make Dinamite Hot Pepper Tapenade which is not as hot as the name implies. A versatile tapenade, with nicely balanced heat from peperoncinos and a delicious blend of olive oil, eggplant, mushrooms, and capers. And of course they have the cherry peppers themselves.